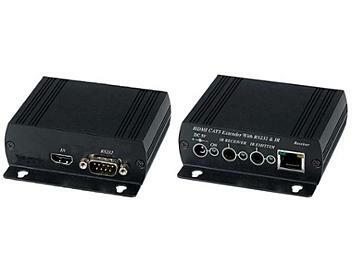 Extends HDMI with control signal over one CAT5/5e/6 cables. Controls signals including RS232 and IR remote control. Uncompressed high definition video up to 1080p@60Hz@48bits and 3D and 4K*2K capable. Maximum Data Rate: 10.2 Gbps. HDMI 1.4 and HDCP compliance. Bi-Directional RS232 interface - commands and data can flow in both directions via RS232, allowing status requests and control of the destination unit. Audio transmission support Dolby TrueHD, DTS-HD MA. Transmission range up to 100 meters at 1080p resolution.